Core Ensemble will present Los Valientes at 7 p.m. Wednesday, Oct. 12 in the Fine Arts Center Recital Hall. The performance is sponsored by Viterbo University and is free and open to the public. Los Valientes (The Courageous Ones) is a live music theatre work for a singing actor and onstage music trio of cello, piano and percussion. Based on the lives of three heroic Latinos, the show celebrates Mexican painter Diego Rivera, martyred Salvadoran Archbishop Oscar Romero, and Mexican-American outlaw Joaquin Murrieta—some say the Zorro character was based on this historical figure. The music ranges from traditional Latino folk and popular songs sung in Spanish to instrumental works by Latin American composers. The work is one of a series of multicultural performance pieces produced by the Core Ensemble over the past 20 years. David Perez-Ribada will portray the three legendary Latinos. 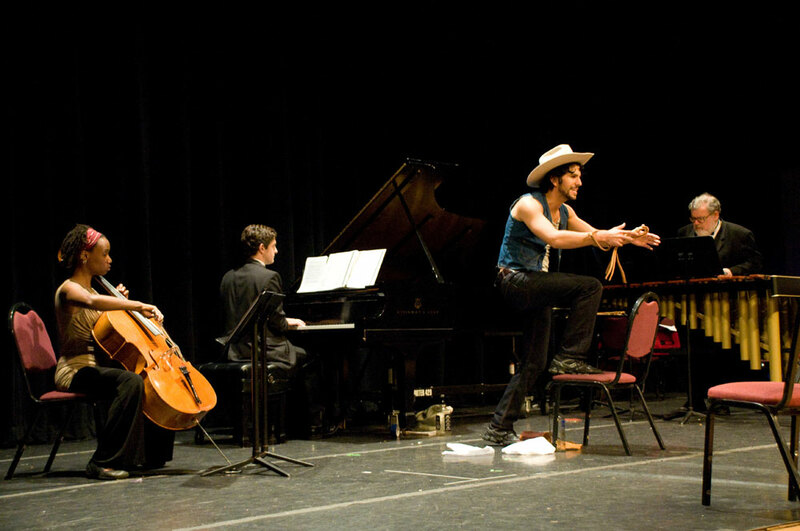 Perez-Ribada has performed a wide variety of stage roles throughout the U.S., including the World Premiere of Anna in the Tropics. He has appeared on the Fox TV Network as well as in several independent films. Core Ensemble consists of Ju Young Lee, cello, Mikael Darmanie, piano, and Michael Parola, percussion, with actor David Perez-Ribada. The group has toured in Australia, England, Russia, Ukraine, the Caribbean, and in every region of the U.S. Core Ensemble has received support from the National Endowment for the Arts, the State of Florida, Department of State, Division of Cultural Affairs, the Florida Humanities Council, and the Palm Beach County Cultural Council. Los Valientes is touring throughout the U.S. during Hispanic Heritage Month Sept. 15-Oct. 15.